Easter is almost upon us and here in the UK, many of you will be looking forward to having some days off work on the first Bank Holiday weekend of the new year. In Britain, Easter occurs at a different time each year. It is celebrated on the Sunday after the first full moon following the first day of spring. This means that the Easter festival can occur on any Sunday between March 22 and April 25. Not only is Easter the end of the winter, it is also the end of Lent, traditionally a time of fasting in the Christian calendar. Many workers are treated to a long bank holiday weekend. It is therefore often a time of fun, celebration and for those who have been fasting… excess. The expression Easter derives from the Old English word Eastre or Eostre. Eostre refers to the Anglo-Saxon goddess of dawn and spring, but under Christian influence, the modern English term Easter took over the present meaning. Hence, the word was borrowed as a semantic loan which means only the word, but not its original meaning is borrowed. Britons will inevitably be celebrating the resurrection of Jesus Christ by eating large quantities of egg shaped chocolates. 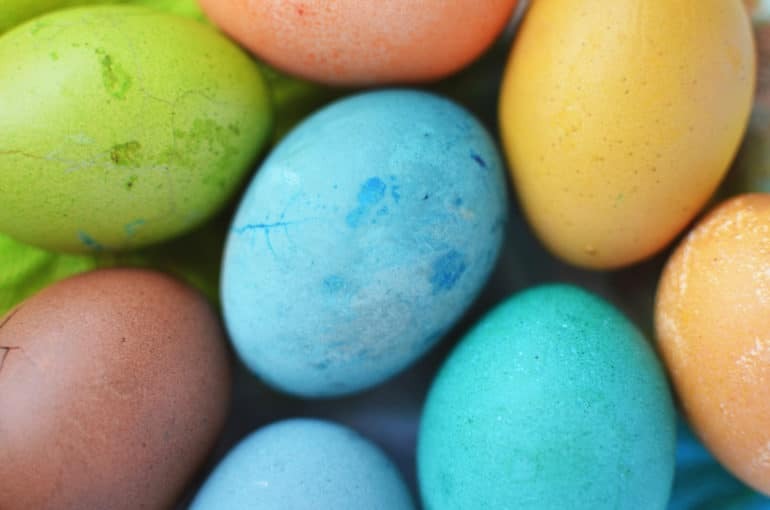 Although Jesus now owns the intellectual property rights on Easter, you may be surprised to find out that Easter was celebrated in Britain before the arrival of Christianity with the mission of Augustine in 597 AD. The eggs themselves are a very old tradition dating to a time before Christianity. In pagan times, eggs were a traditional symbol of fertility and rebirth and were most likely to have been chicken or duck eggs, hard-boiled and painted in various colours and patterns. However, this tradition may not have been unique to the British Isles. In Persia, eggs have been painted for thousands of years as part of the spring celebration of No Ruz, the Zoroastrian New Year. In Iran, coloured eggs are placed on the dinner table at No Ruz, and a mother eats one cooked egg for each child she has. The festival of No Ruz predates the reign of Cyrus the Great, whose rule (580-529 BC) marks the beginning of Persian history. Easter eggs in the UK are normally accompanied by or even delivered to children by Easter bunnies. In folklore, the Easter Bunny carried coloured eggs, sweets and sometimes toys to the homes of children during the Easter season. So in this way, the Easter bunny has many similarities with Santa Claus (or Father Christmas as he is otherwise known in the UK). It might seem strange that a rabbit is associated with Easter, however, the connection to Christianity is less tenuous that one might expect. The idea that a hare could reproduce without the loss of virginity led to a Christian association with the Virgin Mary, with hares sometimes occurring in illuminated manuscripts and Northern European paintings of the Virgin Mary and Christ as a child. While Christians all believe in the same god, there is an amazing diversity of culture and tradition surrounding this unique festival. Similar to the history and culture surrounding Easter in the UK, the Germans also refer to the Anglo-Saxon goddess of spring (Eostre) in their naming of the festival – referred to as Ostern in German. The Anglo Saxon custom of boiling and painting eggs, the symbols of new life, most likely originated in Germany. Many years before the Easter Bunny arrived on the shores of Britain, the Germans have told tales of the festive rabbit to their children. The first mention of the bunny in German writings was in the 16th century. Germans also enjoy a very long Easter weekend: Good Friday and Easter Monday are public holidays in Germany during which shops, banks, and offices are shut. During this period they take the time to greet each other with Frohe Ostern (‘Happy Easter’) and eat the traditional dish of fish on Karfreitag (‘Good Friday’), because a fish is the traditional symbol of Christianity. On Ostersonntag (‘Easter Sunday’), the highlight of the weekend, parents hide baskets filled with coloured, hardboiled eggs, chocolate bunnies, sweets and toys for their children. Colourful Easter eggs are commonly given to children in Germany. In France, Easter is called Paques. The predominant religion in France is Roman-Catholic and no city, village or town is without a church. To mourn the crucifixion of Christ, on the Thursday before Good Friday, all church bells in France are silenced in acknowledgement and mourning of Jesus’ death. Children are told that the bell’s chimes have flown to Rome to see the Pope. The ‘flying bells’ are called Les cloches volantes. To say ‘Happy Easter ‘ you can either say Joyeuses Pâques or Bonnes Pâques. Finally, on Easter morning, the bells ring out in celebration of the Resurrection, declaring that Jesus is alive once again. In many villages, people kiss and embrace one another when they hear the bells ring. The Mardi Gras is the day before Ash Wednesday. It is a very special day and the word literally means ‘fat Tuesday’, because it is the last day where you can eat everything before Lent, which is called Le Carême. In Nice, a town in southern France, the oldest Mardi Gras carnival of the world takes places every year. Things are not all that different in France. Bunnies, chocolate and eggs are also celebrated as symbols of the Easter festival. So, Easter is the perfect time of year for master chocolatiers to display their wares and celebrate their expertise. Easter themed confectionary window display in France. Spain is well-renowned for its Semana Santa or Holy Week traditions. A common feature of Easter celebrations in Spain is the ubiquitous use of the nazareno or penitential robe for use in processions, representing the Christian sacrament of penance, or reconciliation with God. While this might seem like a rather sombre way to celebrate the resurrection of Christ, the festival is not without its own fun, celebration and culinary tradition. On Domingo de Pascua (‘Easter Sunday’), it is traditional in Spanish culture for a godfather to present his godchild with a cake known as ‘La Mona de Pascua’. The word Mona is derived from the Moroccan term meaning ‘gift’ and the word Pascua from Spanish for Easter (la Pascua de Resurrección). Easter eggs are called huevo de Pascua. Another popular Spanish Easter dish is the torrijas. This is a blend of slices of bread soaked in milk, sugar and egg, then fried in olive oil. The dish is served along with wine, syrup, honey, sugar or cinnamon for an extra touch of the festive spirit. The pointed conical hat (a capirote) is commonly worn by brotherhoods in the Catholic church during Easter celebrations. In Italy the Easter Festival is in many ways even bigger than Christmas. The Italians are also graced with a long bank holiday weekend – and while many take the opportunity to travel out of town or even abroad, the towns and cities are still likely to be packed with Italians enjoying Easter or Pasqua as it is known in Italian. ‘Happy Easter’ means Buona Pasqua and an Easter bunny is referred to as il coniglietto pasquale. Like their Spanish cousins, the Italians initially like to take the solemn approach to the celebration of Easter. 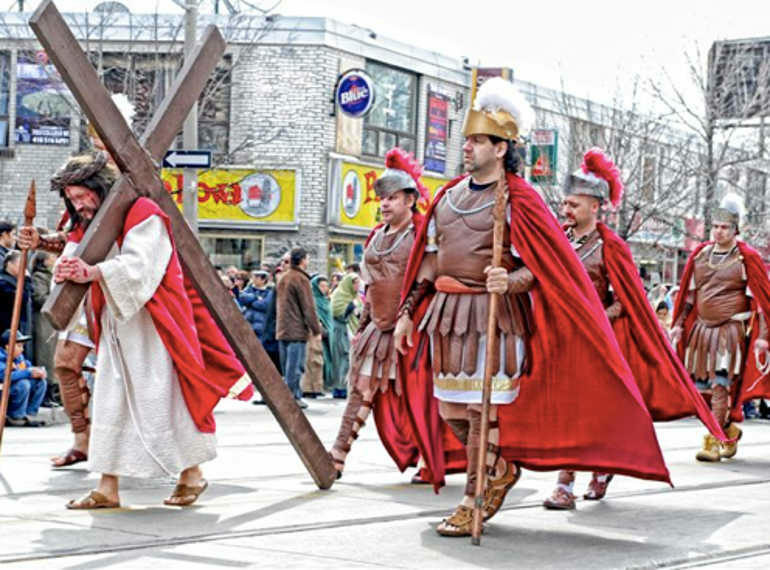 Religious processions are held in many towns on the Friday or Saturday before Easter and sometimes on domenica di Pasqua (‘Easter Sunday’). Many churches have special statues of the Virgin and Jesus that play a big part in the processions. Statues are often paraded through the city or displayed in the main square. Parade participants are dressed in traditional ancient costumes. Olive branches are used as decoration along with palm fronds in the processions and in churches. While Easter mass will be held in every church in Italy, the biggest and most popular mass is held by the il Papa (the Pope) at St. Peter’s Basilica. On Venerdi Santo (‘Good Friday’), the Pope celebrates the Via Crucis or Stations of the Cross in Rome near the Colosseum. A huge cross with burning torches lights the sky as the stations of the cross are described in several languages. At the end of Easter mass, the Pope provides his bendizione di Pasqua (‘Easter blessings’). There are almost as many Christians in Brazil as all the other countries mentioned above combined… This can only mean two things: respectful commemoration of thousands and a big party! The Páscoa (‘Easter’) celebrations in Brazil begin with the Holy Week rituals, involving the blessing of palm branches interwoven into intricate patterns representing various symbols of Christianity. Like the Spanish and Italians, Brazilian worshippers take out procession walks, carrying statues of the Virgin Mary and the body of Jesus Christ. As can be expected of the Brazilians, it is not all sombre. Instead of celebrating after Sexta-feira Santa (‘Good Friday’) as it is common in Europe, in Brazil the party begins weeks beforehand. The world-renown Rio Carnival precedes the ‘Ash Wednesday’, the first of 40 days of the Lent. ‘Sambodromo’, the mile-long parade in Rio, is thronged by a huge crowd of locals and tourists from around the globe. On the last Sunday and Monday nights before Lent, the enchanted onlookers are cheered up by Samba dance troupes, participating in the celebration. But not only Rio celebrates Easter in such a pompous way. Other cities and towns, for instance Recife, are well known for their folkloric representations and folk dances, namely the Frevo and the Maracatu. Streets are filled with stalls and shops, especially built for selling cheap Easter bunnies. On the actual Easter day, gala carnivals take place throughout the country to remember the Resurrection of Jesus Christ. The Macela flower is a popular symbol of Easter in Brazil. It only blooms in the lent and is worshipped by the devotees of Jesus. On Palm Sunday, people bring the Macela flower to the church service to receive the blessings of the priest. The flower is also used as a herb because it is believed to cure numerous diseases. The Sambodromo in Rio during the last Sunday and Monday before lent. Nearly 90% of Mexicans practice Catholicism which means that nearly 100 million Christians have a reason to believe that the Semana Santa, the holy Week leading up to Easter, is the most important holiday in the church calendar. Passionate celebrations can be found all through the country, with different areas celebrating in different ways. On Domingo de Ramos (‘Palm Sunday’), the arrival of Jesus in Jerusalem is commemorated. Many processions reenacting Jesus’ great entry are conducted and woven palms are sold outside churches. On Viernes Santo (‘Good Friday’), the crucifixion of Jesus Christ is recalled. Like in other countries, processions take place – the largest one in Iztapalapa, south of Mexico City, where over one million people gather every year for the Via Crucis. The Holy Saturday, Sabado de Gloria, is a very special festive occasion. The construction of paper or cardboard figures, sometimes attached to firecrackers, get presented in a parade and burnt afterwards. Domingo de Pascua (‘Easter Sunday’) is differently celebrated than in European countries: Children do not get Easter Bunnies or chocolate eggs. This day is entirely dedicated to go to the Easter Mass and celebrate quietly with your family. The burning of a cardboard figure during the Sabado de Gloria in Mexico. At TranslateMedia we sincerely hope that you have a wonderful Easter and enjoy the first long bank holiday weekend of the year!